A-HOTEL.com - Luxury and cheap accommodation in Bolgar, Russia. Prices and hotel, apartment booking in Bolgar and surrounding. This indicative offer was derived from the most recently booked accommodation in Bolgar and sort by the price, from cheapest Bolgar accommodation to the most expensive hotels. To select accommodation by your preferences we recommend to choose from 2 accommodation offers in Bolgar in total. By entering the dates of your overnight stay in Bolgar and using the filter tools you can sort the best possible accommodation for you. The entered dates of your stay are crucial for the most accurate offer as it derives all the online information on pricing and availability of Bolgar accommodation. Then you can book the selected Bolgar lodging (hotels, apartments etc.) immediately. Boasting free bikes, Kol Gali Resort&Spa is set in Bolgar, 9 km from Hazine National Art Gallery. With a seasonal outdoor swimming pool, the 5-star hotel has air-conditioned rooms with free WiFi. Featuring free WiFi, Regina Hotel Bolgar offers accommodation in Bolgar, at the banks of the Volga River. Guests can enjoy the on-site restaurant. Hotel Kamsky Trofei has a garden and a terrace in Kamskoye Ust'ye. Among the various facilities of this property are a shared lounge and ski storage space. Hotel Landyshy is set in Buinsk and has a garden and a terrace. The property offers a 24-hour front desk and free WiFi is available. Located in unique resort area in Undory, 30 km from Ulyanovsk, Sanatory Lenina is the only resort in Russia using waters with high organic substances content. The health resort offers a wide range of treatments, including those for digestive tract disorders, urological condition, cardiovascular diseases, diseases of the musculoskeletal system disorders and gynaecological diseases. Gostinitsa Medvedeff is located in Cherdakly, 30 km from Ulyanovsk. The inn has a sauna and hammam, and guests can enjoy a drink at the bar. 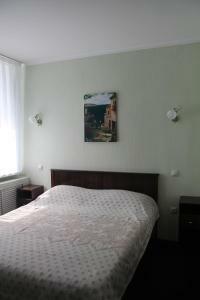 Hotel Telega is offering accommodation in Mirnyy. Featuring a 24-hour front desk, this property also provides guests with a restaurant. Offering free WiFi, A - Otiel is situated in Ulyanovsk. The accommodation offers a 24-hour front desk. Located in Zavolzhskiy district in Ulyanovsk, ibis Ulyanovsk offers free WiFi. The hotel boasts Ibis Kitchen restaurant with European cuisine, a lobby bar and a 24-hour front desk. ONAKO-Kometa Hotel features free WiFi and rooms with air conditioning in Ulyanovsk. Boasting a 24-hour front desk, this property also provides guests with a restaurant. Apartment on Novosondenskiy 5 is located in Ulyanovsk. Guests staying at this apartment have access to a fully equipped kitchenette. Situated in Ulyanovsk, Grand Hotel features a shared lounge and free WiFi. Boasting a 24-hour front desk, this property also provides guests with a restaurant. Situated in Peschanyye Kovali, Гостевой дом у озера offers a private beach area, a garden and a barbecue. The holiday home features lake views and is 29 km from Kazan. Offering free WiFi and mountain views, Guest house on 2-ya Sadovaya 26 is an accommodation situated in Soroch'i Gory. This country house features a garden and barbecue facilities. Offering free Wi-Fi and free private parking, this hotel is situated in Ulyanovsk. Guests enjoy 24-hour access to the reception, and the city centre is a 30-minute drive away. Riviera village is set in Soroch'i Gory and offers a seasonal outdoor swimming pool. The country house is in an area where guests can engage in activities such as skiing, cycling and hiking. Boasting a sauna, Forest House is situated in Soroch'i Gory. Guests staying at this holiday home have access to a terrace. This hotel is 10 minutes’ walk from the Volga riverbank in Ulyanovsk and offers modern rooms with free Wi-Fi. It also features a swimming pool and several saunas. Located in Zavolzhskiy District, just a 5-minute drive from Ushakova Park, Hotel Nika features a sauna, indoor swimming pool and BBQ. This property offers free Wi-Fi and a free car park. Baza Otdykha Ivolga offers accommodation in Ulyanovsk. The accommodation has a seating area.